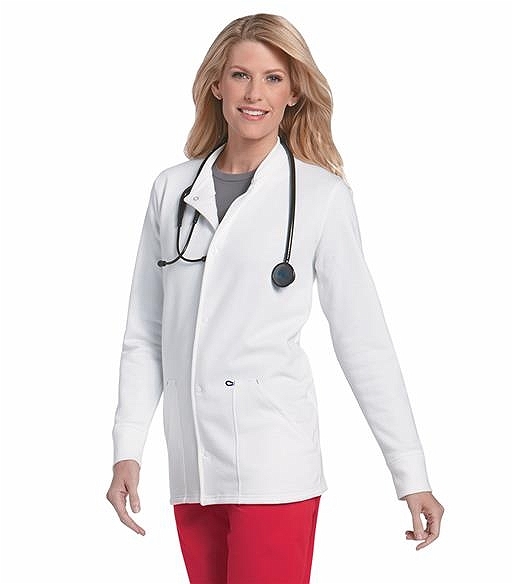 Feel fresh even when you are on the graveyard shift with this snap front warm-up jacket. The fleece lined essential can easily be transitioned from work to after-hour drinks with friends thanks to its classic and soft fit. Keep your hands free throughout the day by using the two roomy pockets that are perfect for carrying around your work day essentials, plus a contrasting blue bungee loop ideal for a pen or your id badge. Completing the no nonsense design are cozy knit cuffs and a matching neck band that deter any uncomfortable chaffing or tugging during the day. Note: Women's inseams approximately 31". Women's petite inseams approximately 28". Women’s tall inseams approximately 33".